Commercial Hexagonal Recycled Plastic Picnic Table with 3 Attached Benches, 258 lbs. 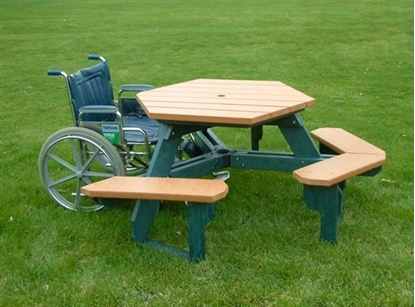 This commercial hexagon picnic table has been a best selling industry standard for over 15 years due to the high quality recycled plastic material which provides a long life with low maintenance. Features 3 attached benches and umbrella hole. Available in a variety of color combinations to match your park, school, restaurant or any outdoor venue. Ships unassembled with stainless steel hardware included. • Check out the Click here for easy assembly instructions. Rectangular Picnic Table 6 Foot Recycled Plastic, 214 lbs.